To inform clients that the resource they’re requesting now resides at a different location. Example use cases are when your website’s domain name has changed, when you want clients to use a canonical URL format (either with or without the www prefix), and when you want to catch and correct common misspellings of your domain name. The return and rewrite directives are suitable for these purposes. To control the flow of processing within NGINX and NGINX Plus, for example to forward requests to an application server when content needs to be generated dynamically. The try_files directive is often used for this purpose. 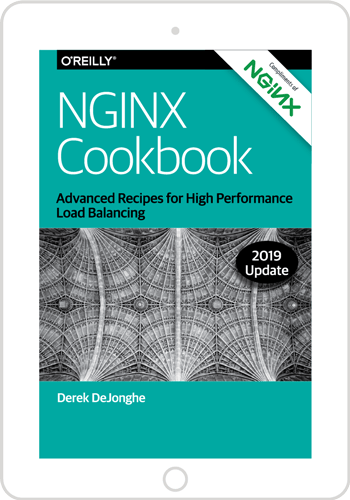 Note: To learn how to convert Apache HTTP server rewrite rules to NGINX rewrite rules, see our companion blog post, Converting Apache Rewrite Rules to NGINX Rewrite Rules. We’ll assume you’re familiar with the HTTP response codes and with regular expressions (NGINX and NGINX Plus use the Perl syntax). The two directives for general‑purpose NGINX rewrite are return and rewrite, and the try_files directive is a handy way to direct requests to application servers. Let’s review what the directives do and how they differ. The return directive is the simpler of the two general‑purpose directives and for that reason we recommend using it instead of rewrite when possible (more later about the why and when). You enclose the return in a server or location context that specifies the URLs to be rewritten, and it defines the corrected (rewritten) URL for the client to use in future requests for the resource. The listen directives mean the server block applies to both HTTP and HTTPS traffic. The server_name directive matches request URLs that have domain name www.old‑name.com. The return directive tells NGINX to stop processing the request and immediately send code 301 (Moved Permanently) and the specified rewritten URL to the client. The rewritten URL uses two NGINX variables to capture and replicate values from the original request URL: $scheme is the protocol (http or https) and $request_uri is the full URI including arguments. For a code in the 3xx series, the url parameter defines the new (rewritten) URL. For other codes, you optionally define a text string which appears in the body of the response (the standard text for the HTTP code, such as Not Found for 404, is still included in the header). The text can contain NGINX variables. There are also a couple syntactic shortcuts you can use, such as omitting the code if it is 302; see the reference documentation for the return directive. So the return directive is simple to use, and suitable when the redirect meets two conditions: the rewritten URL is appropriate for every request that matches the server or location block, and you can build the rewritten URL with standard NGINX variables. But what if you need to test for more complicated distinctions between URLs, capture elements in the original URL that don’t have corresponding NGINX variables, or change or add elements in the path? You can use the rewrite directive in such cases. But the first argument, regex, means that NGINX Plus and NGINX rewrite the URL only if it matches the specified regular expression (in addition to matching the server or location directive). The additional test means NGINX must do more processing. A second difference is that the rewrite directive can return only code 301 or 302. To return other codes, you need to include a return directive after the rewrite directive (see the example below). And finally the rewrite directive does not necessarily halt NGINX’s processing of the request as return does, and it doesn’t necessarily send a redirect to the client. Unless you explicitly indicate (with flags or the syntax of the URL) that you want NGINX to halt processing or send a redirect, it runs through the entire configuration looking for directives that are defined in the Rewrite module (break, if, return, rewrite, and set), and processes them in order. If a rewritten URL matches a subsequent directive from the Rewrite module, NGINX performs the indicated action on the rewritten URL (often rewriting it again). This is where things can get complicated, and you need to plan carefully how you order the directives to get the desired result. For instance, if the original location block and the NGINX rewrite rules in it match the rewritten URL, NGINX can get into a loop, applying the rewrite over and over up to the built‑in limit of 10 times. To learn all the details, see the documentation for the Rewrite module. As previously noted, we recommend that where possible you use the return directive instead. Here’s a sample NGINX rewrite rule that uses the rewrite directive. It matches URLs that begin with the string /download and then include the /media/ or /audio/ directory somewhere later in the path. It replaces those elements with /mp3/ and adds the appropriate file extension, .mp3 or .ra. The $1 and $2 variables capture the path elements that aren't changing. As an example, /download/cdn-west/media/file1 becomes /download/cdn-west/mp3/file1.mp3. If there is an extension on the filename (such as .flv), the expression strips it off and replaces it with .mp3. We mentioned above that you can add flags to a rewrite directive to control the flow of processing. The last flag in the example is one of them: it tells NGINX to skip any subsequent Rewrite‑module directives in the current server or location block and start a search for a new location that matches the rewritten URL. The final return directive in this example means that if the URL doesn’t match either rewrite directive, code 403 is returned to the client. NGINX checks for the existence of the files and directories in order (constructing the full path to each file from the settings of the root and alias directives), and serves the first one it finds. To indicate a directory, add a slash at the end of the element name. If none of the files or directories exist, NGINX performs an internal redirect to the URI defined by the final element (uri). For the try_files directive to work, you also need to define a location block that captures the internal redirect, as shown in the following example. The final element can be a named location, indicated by an initial at‑sign (@). The try_files directive commonly uses the $uri variable, which represents the part of the URL after the domain name. In the following example, NGINX serves a default GIF file if the file requested by the client doesn’t exist. When the client requests (for example) http://www.domain.com/images/image1.gif, NGINX first looks for image1.gif in the local directory specified by the root or alias directive that applies to the location (not shown in the snippet). If image1.gif doesn’t exist, NGINX looks for image1.gif/, and if that doesn’t exist, it redirects to /images/default.gif. That value exactly matches the second location directive, so processing stops and NGINX serves that file and marks it to be cached for 30 seconds. One of the most common uses of NGINX rewrite rules is to capture deprecated or nonstandard versions of a website’s domain name and redirect them to the current name. There are several related use cases. This is less efficient than the equivalent return directive, because it requires NGINX to process a regular expression, albeit a simple one (the caret [ ^ ], which matches the complete original URL). The corresponding return directive is also easier for a human reader to interpret: return 301 more clearly indicates that NGINX returns code 301 than the rewrite ... permanent notation does. Again, return is preferable to the equivalent rewrite, which follows. The rewrite requires interpreting a regular expression – ^(. *)$ – and creating a custom variable ($1) that in fact is equivalent to the built‑in $request_uri variable. Here’s a special case that redirects incoming traffic to the website’s home page when the request URL doesn’t match any server and location blocks, perhaps because the domain name is misspelled. It works by combining the default_server parameter to the listen directive and the underscore as the parameter to the server_name directive. We use the underscore as the parameter to server_name to avoid inadvertently matching a real domain name – it’s safe to assume that no site will ever have the underscore as its domain name. Requests that don’t match any other server blocks in the configuration end up here, though, and the default_server parameter to listen tells NGINX to use this block for them. By omitting the $request_uri variable from the rewritten URL, we redirect all requests to the home page, a good idea because requests with the wrong domain name are particularly likely to use URIs that don’t exist on the website. This server block forces all visitors to use a secured (SSL/TLS) connection to your site. But this method takes extra processing because NGINX must both evaluate the if condition and process the regular expression in the rewrite directive. NGINX and NGINX Plus are very popular application delivery platforms for websites that use WordPress. The following try_files directive tells NGINX to check for the existence of a file, $uri, and then directory, $uri/. If neither the file or directory exists, NGINX returns a redirect to /index.php and passes the query‑string arguments, which are captured by the $args parameter. For various reasons, your site might receive request URLs that end in a file extension corresponding to an application server you’re not running. In this example from the Engine Yard blog, the application server is Ruby on Rails, so requests with file types handled by other application servers (Active Server Pages, PHP, CGI, and so on) cannot be serviced and need to be rejected. In a server block that passes any requests for dynamically generated assets to the app, this location directive drops requests for non‑Rails file types before they hit the Rails queue. Strictly speaking, response code 410 (Gone) is intended for situations when the requested resource used to be available at this URL but is no longer, and the server does not know its current location, if any. Its advantage over response code 404 is that it explicitly indicates the resource is permanently unavailable, so clients won’t send the request again. Code 403 implicitly confirms that the requested resource exists, so code 404 might be the better choice if you want to achieve “security through obscurity” by providing the client with as little information as possible. The downside is that clients might repeatedly retry the request because 404 does not indicate whether the failure is temporary or permanent. In this example from MODXCloud, you have a resource that functions as a controller for a set of URLs. Your users can use a more readable name for a resource, and you rewrite (not redirect) it to be handled by the controller at listing.html. As an example, the user‑friendly URL http://mysite.com/listings/123 is rewritten to a URL handled by the listing.html controller, http://mysite.com/listing.html?listing=123.